Auto Collision Specialists takes pride in our ability to restore damaged vehicles to pre-accident condition, and we’re all about delivering a safe, structurally sound repair. In fact, nothing is more important to us than safety, and we take every opportunity to share information with drivers that will protect them, and their families, after an accident. 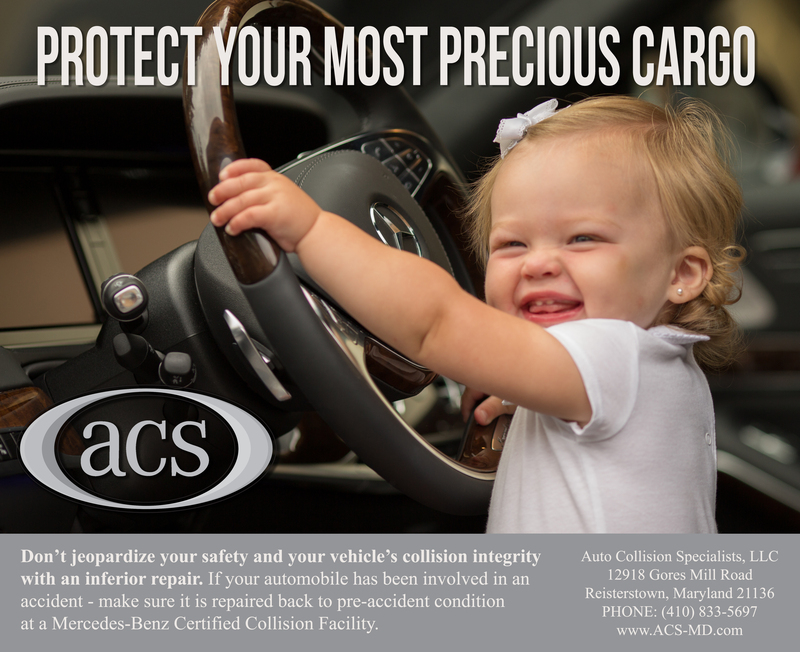 If you’d like a free estimate from an Auto Collision Specialists representative, please give us a call at (410) 833-5697 or click here to contact us online. In order for a seat belt to properly protect you in the event of an accident, it must be positioned correctly on your body. A shoulder belt is designed to be worn across the collar bone and chest, not the neck or shoulder, and a lap belt is supposed to be worn below the abdomen and hip bone. If a child is too small for a seat belt to fit him or her in this way, he or she is at risk of suffering head, abdominal and spinal injuries. A booster seat ensures that a child is properly supported by a seat belt. One study showed that children ages 4-8 are 45% less likely to be seriously injured when using child booster seats versus just seat belts. State laws concerning booster seats vary widely, with children being required to use them until anywhere from 5 to 8 years old depending on the state. Evidence has shown that children are less likely to be killed in auto accidents in states with more stringent child booster seat laws. 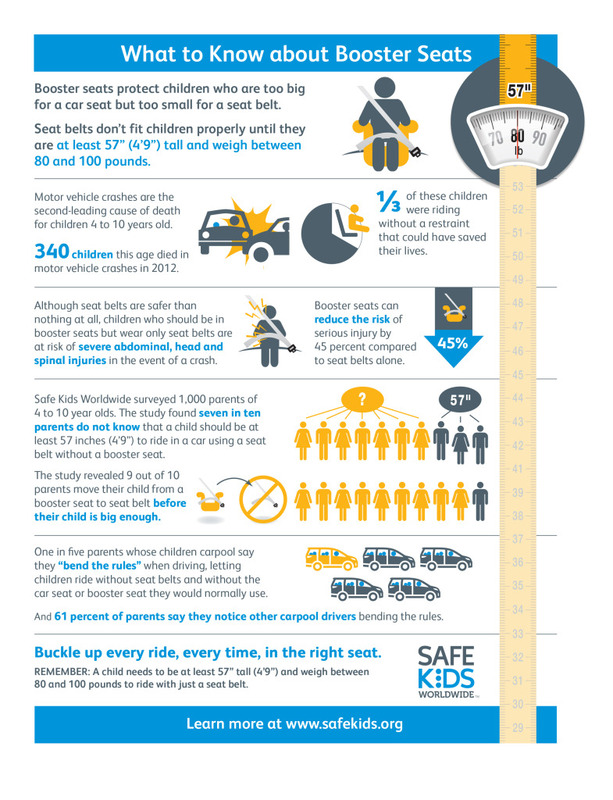 Research has shown that children should use booster seats until they reach a height of 4 feet 9 inches and weigh 80-100 pounds. One survey indicated that 71% of parents were unaware that children should be at least this tall before graduating from booster seats. Even more discouraging is the fact that only 3% of parents surveyed waited until their children were 4 feet 9 inches tall to stop using a booster seat, and only 6% of the parents waited until their children reached 80 pounds. If your child carpools, you should talk with the other parents about how your child is restrained. You can also make an appointment with a trained technician who can show you how to properly use a child booster seat (you can find someone in your area here). It’s also important not to let state law dictate whether you use a booster seat for your child. Just because it isn’t required at a certain age doesn’t necessarily mean that your child is ready to give up his or her booster seat. This decision should be based on the previously mentioned height and weight guidelines. kids are often more willing to use them than their high-back counterparts. The Insurance Institute for Highway Safety (IIHS) evaluates child booster seats, and numerous booster seats ranging from $20 to several hundred dollars have achieved the highest IIHS rating. You can use this car seat finder tool to figure out which booster seat is right for your child. Hopefully you’ll never have to find out how well your child booster seat works, but if you’re involved in a collision it’s essential that your child is restrained correctly. 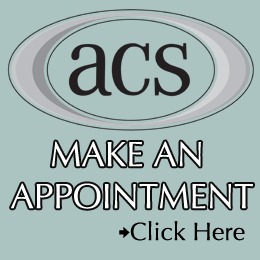 If you do have an accident, ACS will make sure that your vehicle is expertly repaired.